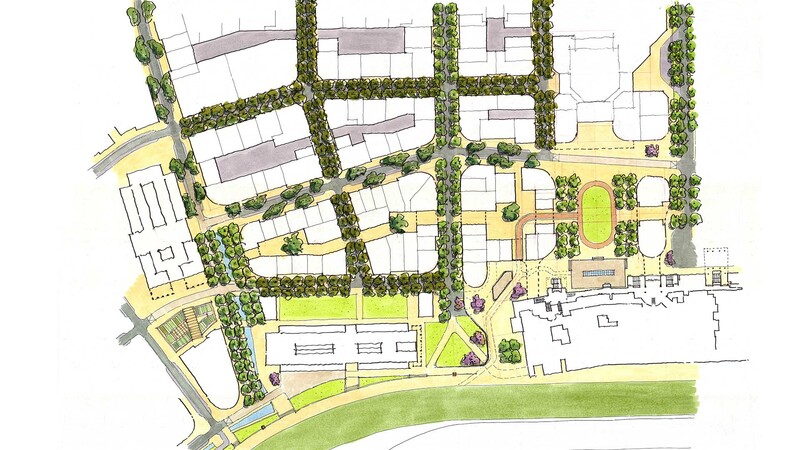 A re-envisioned Woodbine knits together a new urban street grid with a large green corridor connection to celebrate and emphasize the heart of the site. All roads lead to the track. 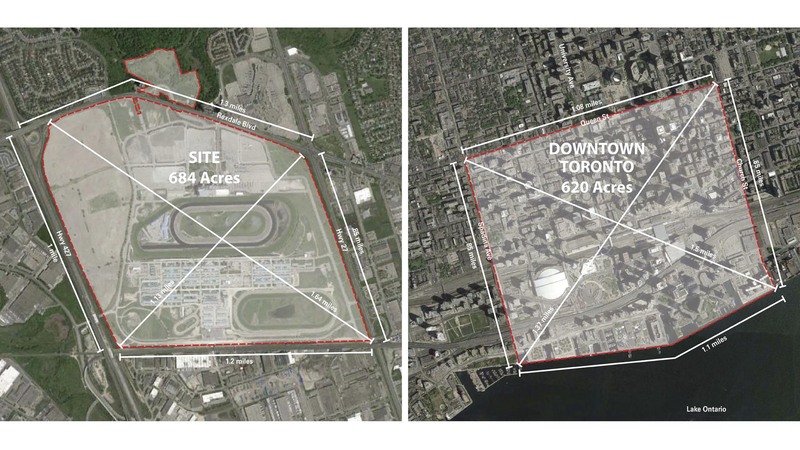 At the scale of downtown Toronto, the 684 acres of the Woodbine site has an incredible potential for a large-scale, city-building initiative. A series of guiding principles help set the direction for the design of the site, combining into a framework that defines a new heart for Toronto. 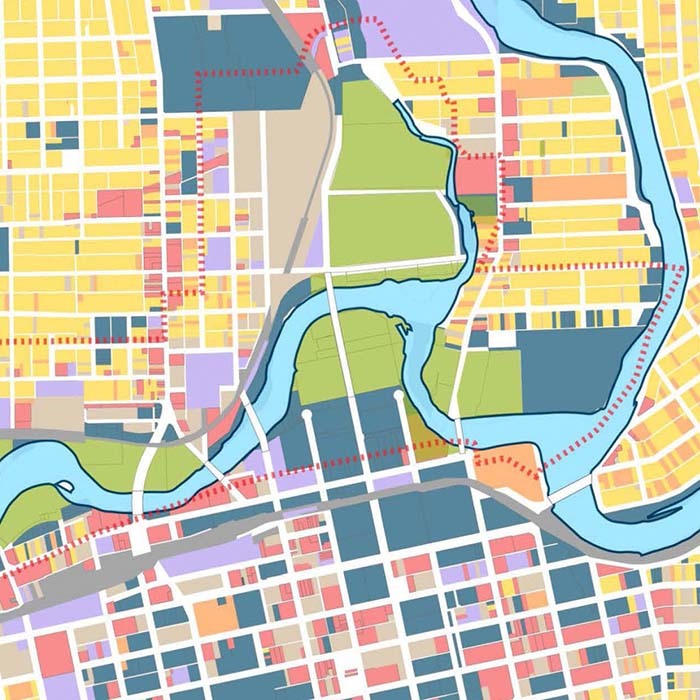 A series of new districts surround and embrace the track while reinforcing a new open space connection between Humber River and Mimico Creek. 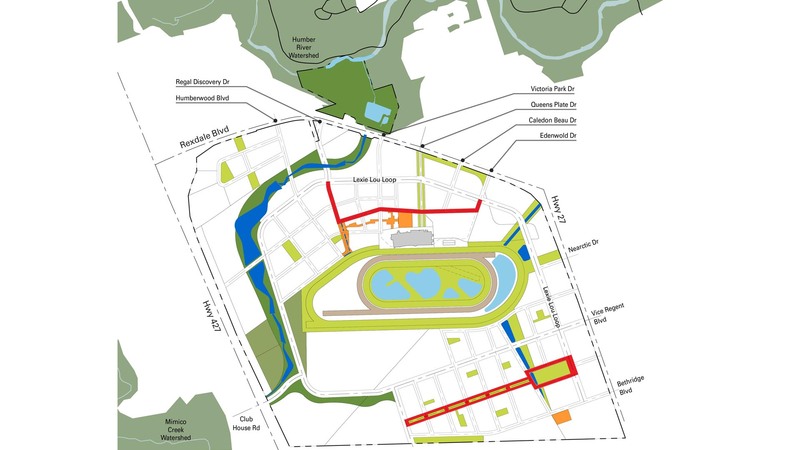 Woodbine’s open space framework is anchored by a large green corridor, connecting the Humber River Valley to Mimico Creek, the racing surfaces and infield, Woodbine’s Central Park, and the Urban Promenades that structure the built environment. 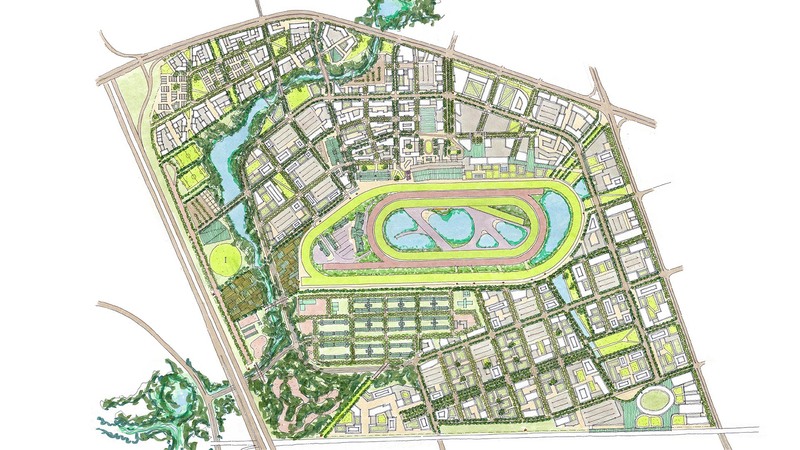 The Woodbine Master Plan celebrates the track and thus the horse as the heart of the site from which a modified grid radiates to structure a series of districts around the track. 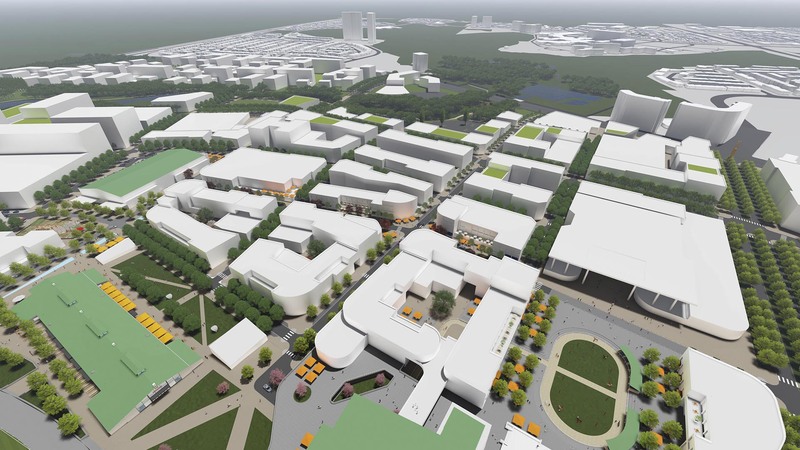 The urban village just north of the track is the beating pulse of Woodbine’s heart, anchored by Woodbine Square and a highly programmed mixed-use urban environment. 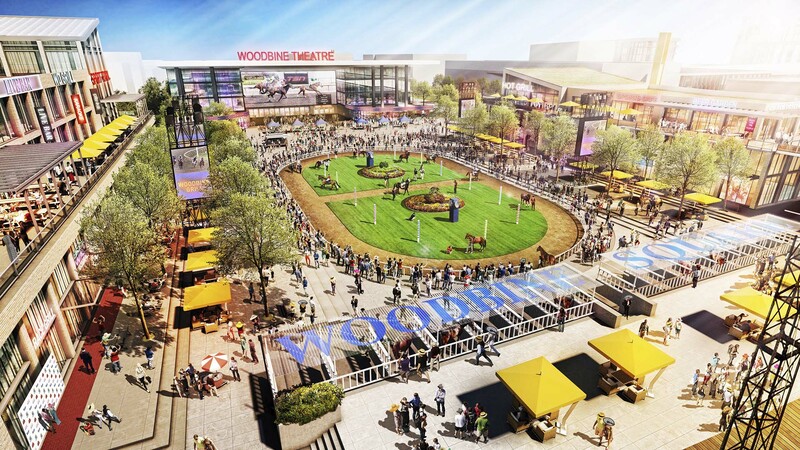 Woodbine Square is a thriving, interactive and year-round celebration plaza engaging and interacting with horse racing culture as well as numerous weekly and seasonal events and festivities. 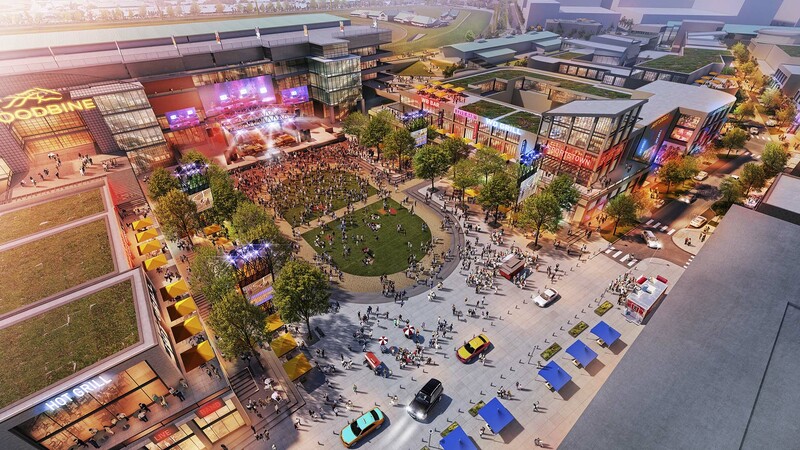 On race day, the square will offer a staging ground to showcase world-class horsemen and horses to the public and encourage interaction via a redesigned walking ring and horse parade path within a new mixed-use entertainment district. Post-race or on other days throughout the year, Woodbine Square becomes a venue for concerts, telecasts or local and regional celebrations. 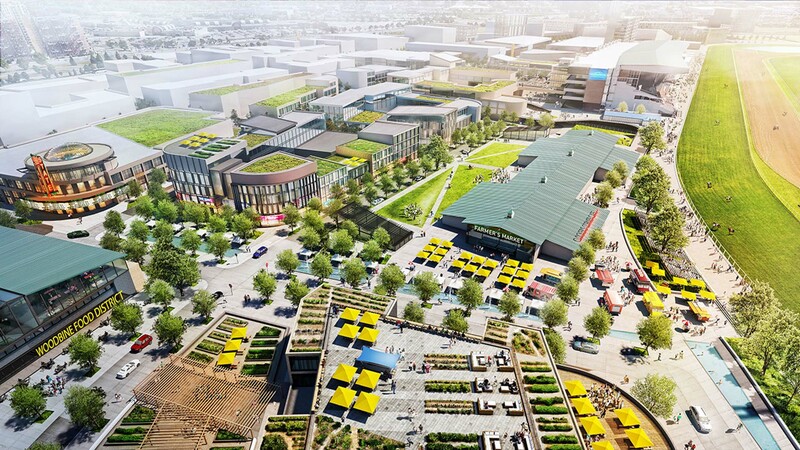 The former standardbred paddock has been converted into the Woodbine Food Hall, anchoring a dynamic district focused on family enjoyment, public events, and race day fun. 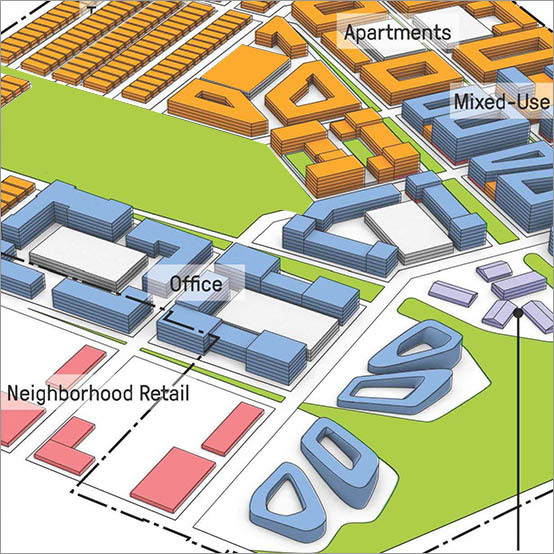 The gaming district anchors the northeast corner of the site, extending the gaming programming as well as bringing nightlife, entertainment, hotel, conference and convention center uses to the site. 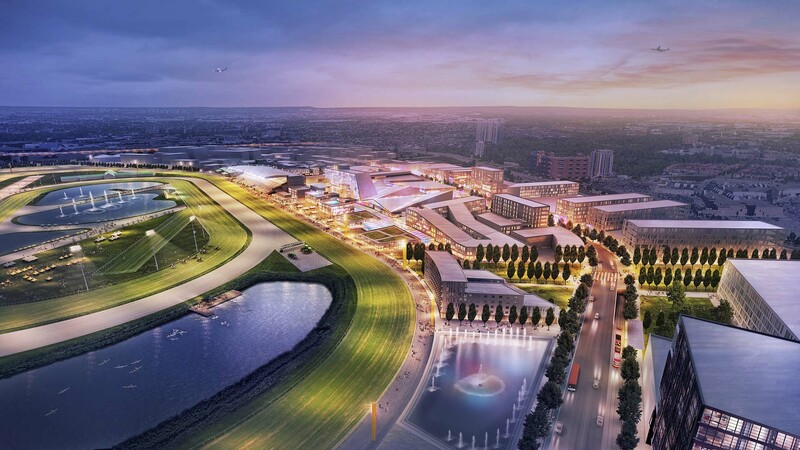 The Woodbine Racetrack site envisions a new future: A City within a City – an exhilarating place to live, work, study and recreate. The project transforms the largest undeveloped tract within Toronto into an iconic and dynamic, fully integrated, transit-oriented mixed-use district. 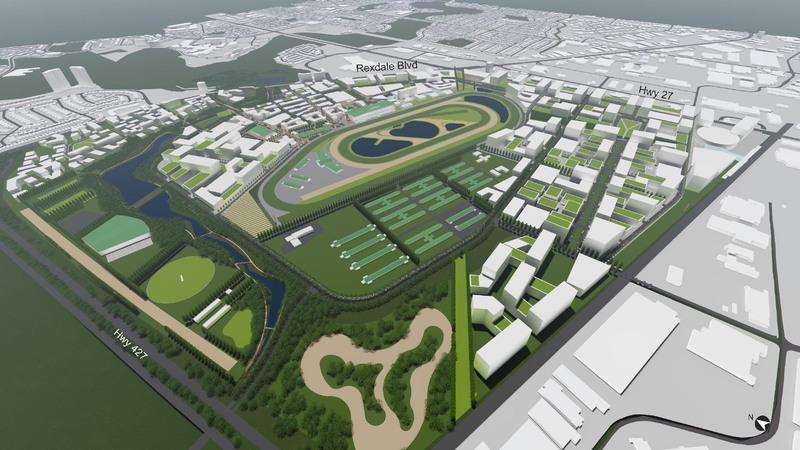 Capitalizing on the racetrack’s legacy and the site’s natural, cultural, and locational assets, the project is designed to become a new heart in Toronto. 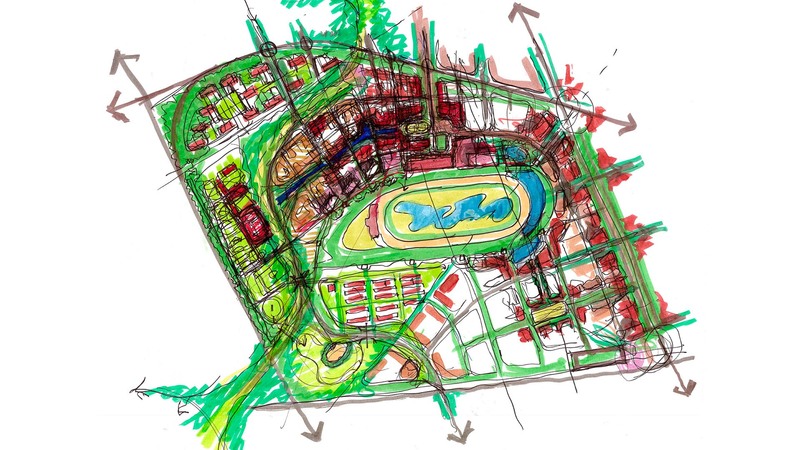 The master plan includes a diversity of open spaces throughout to provide relief and respite. 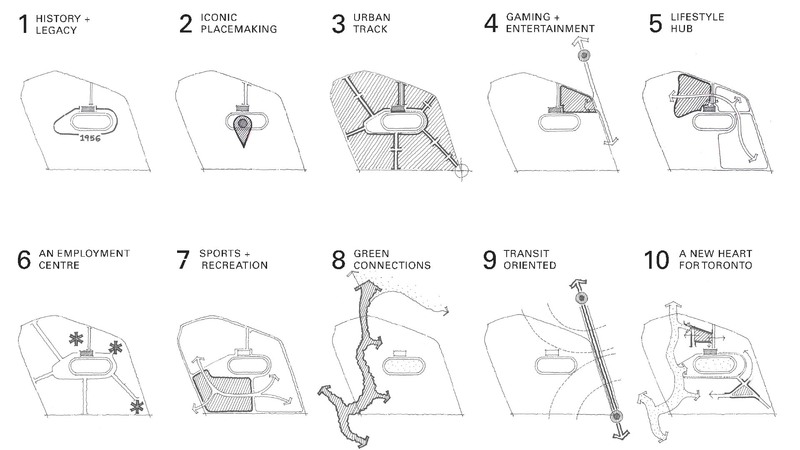 These spaces are anchored by the green corridor, connecting the Humber River Valley to Mimico Creek, the racing surfaces and infield, Woodbine’s Central Park, and the Urban Promenades that structure the built environment. Anchoring the western portion of the site is the green corridor. Due to the drainage basin divide that occurs in the NW corner of the site, the green corridor is divided into two portions. The northern portion drains to the Humber River and the southern portion drains to Mimico Creek with the divide being New Providence St. 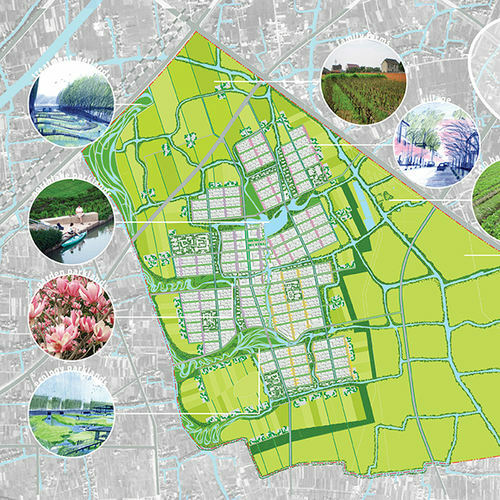 The water in the green corridor is set up as a series of ponds, to traverse the topography and to ensure a high aesthetic quality of the water. The northern ponds have the potential to be part of a staged quality control facility before outletting to the Humber River. The other ponds can be incorporated into the storm water management system as aesthetic ponds.